Tired of cooking dry meat? This Easy Parmesan Crusted Pork Tenderloin is bursting with tender juiciness, lightly-seasoned flavor, and a crisp bite to the exterior. Not only is this pork tenderloin delicious, but it is also addictive! 5 simple ingredients. Dinner is ready! Parmesan Crusted Pork Tenderloin is a common entree in our home. 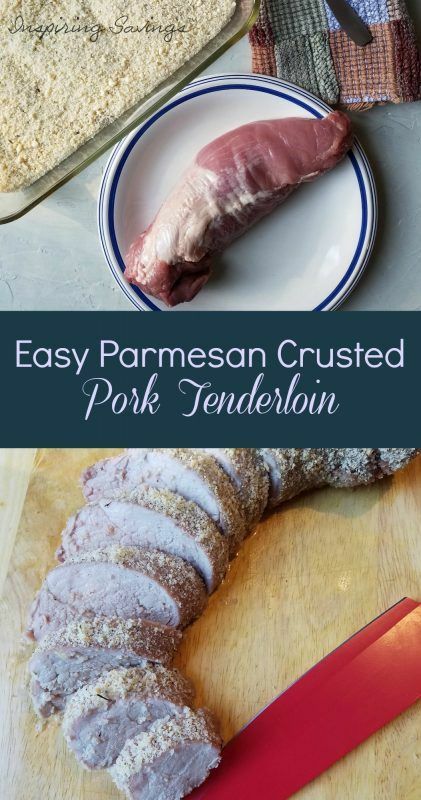 Parmesan, Panko breadcrumbs and Smithfield® Prime Pork Tenderloins are just fabulous creations in their own right. Put them together, and they equal pure deliciousness. If you haven’t tried Smithfield® products, please try it soon. Their pork products make dinner incredible with less work. This Easy Parmesan Crusted Pork Tenderloin is bursting with tender juiciness, lightly-seasoned flavor, and a crisp bite to the exterior. What more could we ask for in a quick weeknight meal? Yes, I did say quick and weeknight in the same sentence. Because it is that easy. Believe me when I say your prep work for this meal will be done in less than 10 minutes. Pork is most definitely known for being the other white meat. There are some really weird looking foods in this world and pork tenderloin is definitely on the top of that list. Even though it is strange looking, it is totally delicious. With that said you just have to get over the weirdness of it all. It is surprisingly lean. I had sworn off pork of any kind many years ago when I was in my “I don’t care for the taste of pork” phase. It eventually dawned on me that with the right cuts, it is a lean protein that makes the taste buds happy. I was just purchasing the wrong brand and cuts. I can honestly say that pork and I have become close friends again. There are a lot of different ways to cook pork tenderloin and plenty of easy pork tenderloin recipes. I cook it at 400 degrees F for around 30 minutes when it’s not seared first. It cooks perfectly and is tender and delicious. However, I changed it up just a little bit for this recipe. I am cooking it at 375 degrees for slightly longer. The reason for this is I the parmesan cheese. High temperatures can cause your cheese to burn. in my book that is “no beuno”! Are you ready to go? Pre-heat your oven to 375 degrees. The next step is to grab a low shallow dish and combine bread crumbs, grated parmesan, thyme, salt, and pepper. This is by far the toughest part. If you can handle this, you can certainly make this Parmesan Crusted Pork Tenderloin recipe a home staple. Next, you are going to want to roll your Smithfield pork tenderloin in the mixture. Coat it until it is well covered. As you can already see this meal is super simple to make. Remove pork from the pan, cover, and let stand 10 minutes before slicing to serve. Gluten Free Option: Substitute gluten-free panko breadcrumbs or gluten-free rice cereal blended into a fine crumb mixture instead of traditional panko breadcrumbs to make this dish gluten-free. Pre-heat over to 375 degrees. Lightly spray foiled wrapped a rectangular baking dish with the nonstick spray. In a shallow dish, combine bread crumbs, grated parmesan, thyme, salt, and pepper. 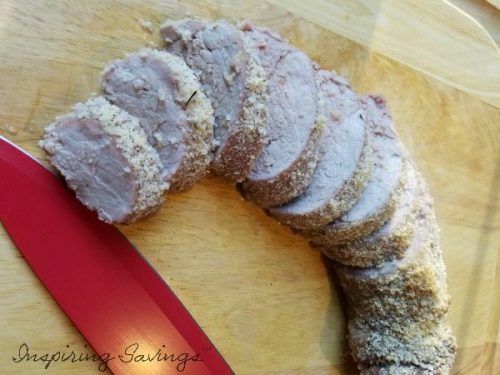 Roll pork tenderloin in the mixture until it is well covered.